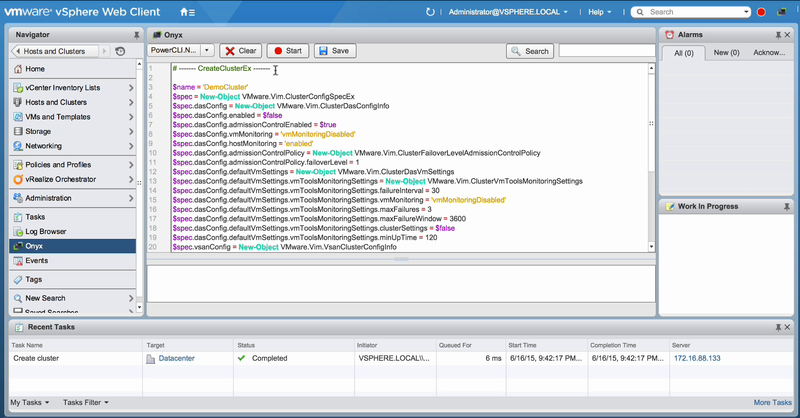 ← PowerCLI 5.8 R1 What’s New? Unfortunately Onyx was not available for the vSphere Web Client. This was a pitty because since vSphere 5.1, new features were not built into the vSphere client. So you could not use Onyx to create PowerCLI for the new vSphere features. I am very happy that VMware now has released a new fling: Onyx for the Web Client. Onyx for the Web Client requires vSphere Web Client version 6.0. Because the installation of Onyx for the Web Client replaces core Web Client files, VMware recommends to install Onyx for the Web Client in a test or development environment only. Onyx for the Web Client comes with an installation guide, that shows you how to install the software on a Virtual Center Virtual Appliance (VCVA) or on vCenter for Windows. The next screen shot shows you Onyx for the Web Client in action. In the top left corner of the window you will see two new buttons. The left button is the start and stop recording button. After starting a recording, PowerCLI code will be created for all of the actions you perform in the web client. To stop recording, push the same button again. Clicking on the button on the right, will open the Onyx window you can see in the screen shot. The Onyx window shows you the created PowerCLI code.